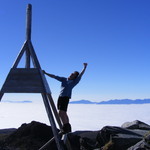 The Kepler Track is a 60 km moderate walking track, taking four days to complete. It is longer than the Milford and Routeburn, has some prolonged climbs and descents, and requires a good standard of fitness. It is a superb Fiordland track, great scenery of mountain, bush and lakes, in Fiordland National Park, South West New Zealand World Heritage Area. The track itself is of a high standard. 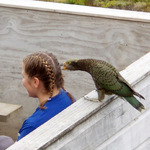 We use the three DoC Huts on the track, Luxmore, Irisburn and Moterau, which are large, with good facilities. 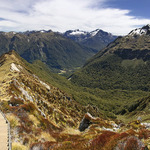 A good standard of tramping fitness is required, and trampers must be well equipped. The track includes an alpine section, where mountain weather can be harsh, as we spend much of one day above the bushline. 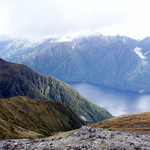 We traverse impressive tussock ridges, climb to the top of Mt Luxmore (1,400 metres), get a "birds eye view" of beautiful Lakes Te Anau and Manapouri. 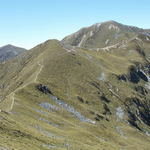 It is a circular track, starting and finishing near Te Anau. 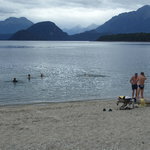 Our last day, at Moterau on the shores of beautiful Lake Manapouri is a sheer delight. Our bus leaves from the Leviathan Hotel, Dunedin at 2.30 pm on the first day. We stay at Te Anau Backpackers overnight, and commence our tramp next morning, and we should return to Dunedin about 6pm on the final day. Airport pick ups and drop offs can be organised. Costs are on the Booking Page. Southern Lakes Helicopters can fly your packs on the first day, from Te Anau to Luxmore Hut. 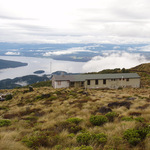 It is a good climb from lake level to Luxmore Hut, sited at over 1000 metres, we would recommend this to those who would like to take advantage of this, at quite a reasonable price. Please do not include any payment for this when you are booking, but you will be contacted at a later date with details of how to pay for the service. You must bring a small, light, day pack to carry your lunch and storm clothing, if your pack is flown in. 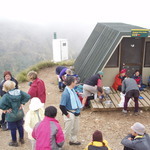 Helicopters are not permitted to fly past Luxmore Hut. We will ask for an indication of numbers before you go on the trip.